Welcome. to a whole new world of productivity for your enterprise account. What is a Cincopa Master Gallery? The best way of explaining it will be to see what you can do with it. By linking a gallery to a Master Gallery, It will take the template and customization settings of the Master. Any changes made to the Master will be magically reflected in the linked gallery. So unlike a preset, You don’t have to re-apply it to countless galleries when you want to change the player color, add a logo to an image gallery or change the timing settings of a slideshow. A Master Gallery can also be a starting point for new galleries, which will automatically be linked, acting as a default template. As the customization options are “locked”, You will go straight to Upload & Manage. 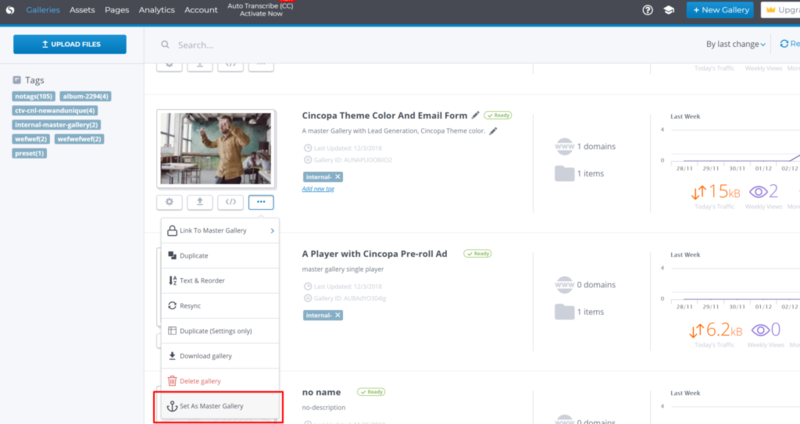 Setting an existing gallery as a master template is done by navigating to galleries, expanding the gallery options and setting it as a master. How do I unlink a gallery and what happens when I unlink it? When customizing a linked gallery, you can unlink it from its Master Gallery. When that happens, It will regain its original template and customization settings. How do I assign a new master gallery? Navigate to the galleries view, Click the dropdown settings of the gallery you wish to assign and set it as a master gallery. Can I delete a master gallery? No. We restriction deletion for your own safety. If you really want to delete a master, contact your account manager. He will be able to do it for you. Can I assign a linked gallery to a different master? What happends to a linked gallery when I change the settings of a Master Gallery? Like some kind of magic, It will change its appearance and behavior instantly. Can I customize a linked gallery? No, You will find the customization view locked.